At Helfi Addiction we have a range of services with something for everyone! At Helfi Addiction Fitness Centre we know that stepping into the gym can be scary. That's why we have qualified personal trainers who can tailor a gym program for your needs and goals. We want you to be getting the most out of your training and achieving your goals as effective as possible. Learn More. Get the benefits of having a Personal Trainer to organise, support and motivate your workouts in our scheduled Group Personal Training Environment. 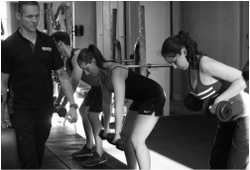 This is the perfect solution if you want to train with like minded respectful people that enjoy a combination of the exercise and social aspect of the experience, while still achieving the results your are seeking. Learn More. If you weren't already aware, your diet is just as important if not more for helping you reach your goals, to break personal bests', lose fat, tone up, aid in recovery and fuel your workouts. If you're in need of nutrition support and assistance, we can help you! There would be nothing worse than ruining all your hard training you've completed in the gym to then fuel your body with poor nutrition. Let us guide you to optimum health and performance. Learn More.